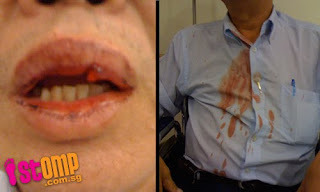 This taxi driver sustained a deep cut on the mouth after being punched in the face for telling a man to stop shaking a lamp post. I believe this type of behaviour not only happen in Singapore but also in Kuala Lumpur particularly to the African passenger. Just ask any taxi driver in KL about the behaviour of the Africans.